The American Academy of Implant Dentistry (AAID) estimates that there are more than 3 million Americans who currently have dental implants -- and that number is growing by as much as 500,000 per year! And while the technology ensures more Americans have a full mouth of teeth (and some beautiful dental work to boot) not all patients are getting them for the usual reasons. Why are more Americans seeking restorative dental care? Trauma, usually in the form of serious sports injuries, is among the most common reasons to seek restorative dental care. In fact, according to the Journal of The American Dental Association, about 13 to 39% of dental injuries result from sports-related trauma. Football players and rugby players, not altogether surprisingly, are most prone to dental injuries -- and some can definitely be serious enough to knock out some teeth. While many of these injuries could be prevented with current dental care and precautions (i.e., mouth guard compliance), the vast majority of athletes learn that lesson the hard way. Athletes, sports enthusiasts, and fitness buffs aren't the only ones susceptible to dental trauma, however. A surprising number of patients look to technology in dentistry and new dental implants to replace teeth after biting down on chicken bones or pulling a tooth out when trying to open a tough plastic package or even a beer bottle (yes, it happens) with their teeth. While smokers may turn to the dentist to whiten teeth and rightfully so (professional teeth whitening can brighten and whiten teeth by up to 10 shades), they may also want to have a conversation about bone density and whether implants are an inevitable part of their future. "A recent study found that over 40% of smokers had lost at least one tooth, compared to less than a third for non-smokers," Healthable.org reveals. In some cases, secondhand smoke can even increase the likelihood of premature tooth loss. Many people associate tooth loss with old age. That isn't always the case. In fact, more Americans are losing teeth due to blunt trauma (thanks to sports injuries or even chicken bones) and loss of bone density after years of smoking. Why Is It So Important to Have a Healthy Smile? Having a healthy smile is a lot more important than you think. Here's why. Naturally, only healthy people have a healthy smile, but did you know that studies have shown that poor oral health can actually lead to more serious issues? A study published in the British Medical Journal found that adults who don't brush as much have a 70% higher risk for heart disease than those who brush twice a day. Columbia University also found that those who suffered from periodontal disease also had a twice as high risk for Type 2 diabetes. Basically, if you want to extend your lifespan, you may want to invest in restorative dental care to get a healthy smile. There are also economic benefits of having a healthy smile. About three-quarters -- 74% -- of adults feel that an unattractive smile can hurt a person's chance for career success. Studies have also shown that children who drank fluoridated water -- water that's had fluoride added to prevent tooth decay -- as children earn 2% more than those who didn't. Basically, if you want to earn more, you might want to improve your smile. The dental patients who have a healthy smile also enjoy some social benefits, too. In fact, 73% of people find those who have straight teeth to be more trustworthy, while 40% of people refuse to date someone who has crooked teeth. Most important of all, though, is the fact that about 92% of people believe that an attractive smile is socially critical . There's a reason why Americans spend about $1.4 billion on teeth whitening products each year, making it the most popular cosmetic dental procedure in the United States. Having a healthy smile is important, and those who do have a great smile are healthier, economically better, and more social. If you have any questions about the benefits of having a healthy smile, feel free to share in the comments. When someone is considering cosmetic dentistry, they are typically most concerned with aesthetic or health considerations. Perhaps their teeth aren’t straight, or they’ve yellowed, or they have a poor bite that’s causing joint or muscle pain. Cosmetic dentistry can address those and more issues, so that patients can enjoy a beautiful and healthy smile for years to come. However, a great cosmetic dentist isn’t just concerned about the physical process of treatment. Dentistry is an area of medicine that causes anxiety for many people. Some studies indicate that as many as 75 percent of adults in the U.S. experience some form of dental fear; as many as 10 percent of adults experience dental phobia, which may cause them to avoid dental care completely. At Koval & Koval, we want our patients to feel comfortable every step of the way. From the complimentary consultation, through treatment, through the final follow-up visit, we understand that a comfortable, happy patient will enjoy a more successful course of treatment than one who is fearful and stressed. What makes Dr. Koval truly stand out in her field isn’t just her years of experience and commitment to continuing education – it’s her concern for the physical and emotional well-being of her patients. Dr. Koval listens to her patients, takes the time to help them understand every step of their treatment, and has a caring and compassionate nature that puts patients at ease. Creating a visually appealing and soothing atmosphere also help Dr. Koval’s patients to relax. The entry to her office features a gorgeous tropical fish tank. Visitors can enjoy coffee, tea or spring water from the refreshment center. There are fleece blankets, warm neck pillows and back massaging dental chairs. After treatment, there are moist, scented towels for freshening up. 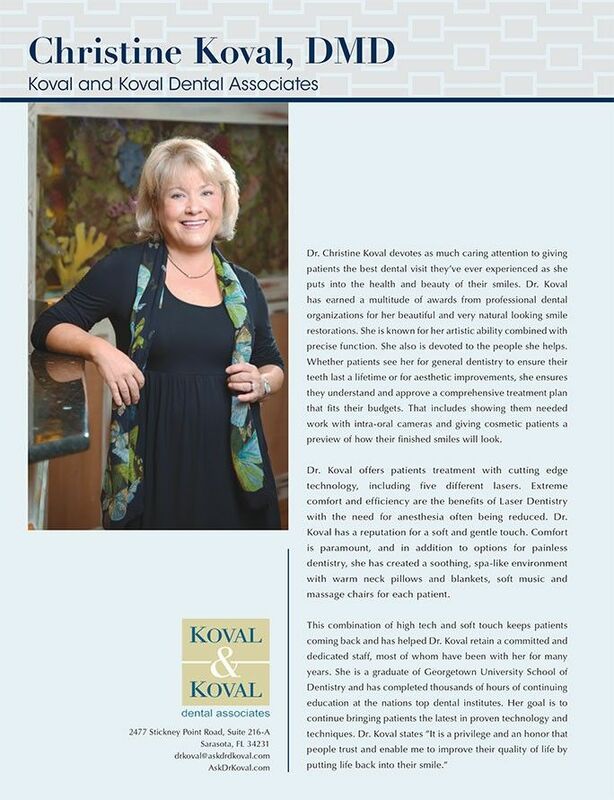 Most importantly, Dr. Koval’s nurturing personality creates a supportive environment for her patients. She understand that many people are nervous about dental procedures and takes great pride not only in her ability to create great smiles, but also in her efforts to nurture happy, worry-free patients. She loves to see her patients smile on the way in AND on the way out of her office. First off, professional tooth bleaching can make your teeth up to 10 shades whiter -- but most importantly, when you turn to a professional for this procedure (rather than using strips out of a box at home), the materials used in a clinic will instantly whiten teeth without using harsh chemicals that could harm your teeth or gums. Another alternative to improve your smile is to have veneers set in place, which will give you an ultra-white color without worrying about any possible damage to your natural teeth. Considering that teeth whitening treatments are currently the most common cosmetic dental procedure in the U.S., you don't have to feel embarrassed or guilty for wanting a healthy smile and a whiter smile. In fact, about 74% of adults today believe that an unattractive smile can have a significant negative effect on a person's professional success -- and it's not hard to see the connection between feeling confident in your appearance and feeling competent at work. Second, contrary to the name itself, cosmetic dentistry is about a lot more than just the exterior appearance of your teeth. Procedures like dental implants, whitening, braces and tooth reshaping are often considered restorative dental care, meaning that the procedures restore your natural teeth as much as possible and can help improve the overall health of your mouth as well. It's worth mentioning that oral health doesn't affect just your mouth. Your overall health can decline when you do not take care of your teeth and gums; plaque buildup, for example, can increase your likelihood of developing heart disease. Quite simply, you owe it to your body to improve your smile! Choosing to improve your smile with the help of dental implants is definitely one of the best decisions you can make, especially if you’ve been battling dental health problems for a while. This restorative dental care procedure uses the most groundbreaking technology in dentistry to offer a success rate of approximately 98%, and the current population of three million Americans with dental implants is increasing by about 500,000 new patients each year. First, it’s important to remember that tooth implant healing takes some time because this restorative dental care procedure is more invasive than a traditional denture fitting -- the implants take the place of your teeth's missing roots, so it’s normal for your mouth to be sore as it adjusts to the new implants. If you notice any excessive inflammation or pain, don’t hesitate to bring up your concerns with your dentist. Even though dental implants can’t get cavities like your natural teeth can, it’s still important to care for your implants as though they were regular teeth -- which means you still have to brush and floss daily. Bacteria can still build up around your replacement teeth and cause gum disease, and unless you received a full mouth of teeth replacements, this bacteria buildup can lead to tooth decay and cavities in your remaining natural teeth. Most regular tooth cleaning products (like toothpaste and mouthwash) can be used on dental implants, and if you’ve received single or partial implants, it’s very important to keep these teeth as clean as you normally would. Some brands of toothpaste (or even hard toothbrushes) can wear down the materials of your implants, so be sure to ask your dentist about any restrictions. Now we’re turning to our readers for some help! If you’ve received dental implants before, what tips would you give to other patients about how to care for implants? Be sure to share your advice, questions, and comments with us! Research tells us that smiling reduces stress and has long-term positive benefits for health and success. When we smile, it sets off a chain reaction that feeds through the muscles of the face, goes back into the brain and releases serotonins and endorphins, which reinforces feelings of happiness and joy. So what might be getting in the way of someone’s smile? For some, fear or a lack of financial resources may have kept them from the dentist or orthodontist when they were younger, leading to decay and damage later on. It is also natural for teeth to yellow over time. Whatever the root causes, there are far too many people for whom their smile doesn’t reflect their inner personality. Even more serious are the negative health effects of a flawed smile or damaged teeth. Cosmetic dentistry is the art of enhancing – rather than changing – a person’s appearance through various techniques applied to the teeth and gums. For some people, it’s an option to restore health to decayed or damaged teeth. For others, a younger and more attractive smile is a major component in achieving overall self-improvement and greater self-confidence. You may be surprised to learn that cosmetic dentistry is not only done for cosmetic purposes. A poor bite can affect joints, facial muscles and even posture. I have helped many patients correct their bites, enhance chewing and digestion, and correct speech issues. There have been numerous advancements made in the field of aesthetic dentistry in recent years. Digital x-rays reduce a patient’s exposure to radiation by 90% and can be viewed instantaneously, at a greater quality than ever before. The materials to make crowns and veneers are more predictable, comfortable and efficient to work with – procedures that used to require multiple visits can now be performed in only one or two. They also look more like natural teeth than ever before. Lasers have provided the greatest advances in dental care. They have reduced the need for profound anesthesia and greatly diminished post-treatment pain. Lasers can help modify an obtrusive or uneven gum line, and can be used to detect and treat decay. Low level lasers are used to decrease pain and inflammation of TMJ. Lasers can be utilized to perform biopsies and other minor surgeries with little or no anesthesia, and no need for stitches. The “right” cosmetic dentist should have an eye for aesthetics, extensive experience, a commitment to continuing education, access to the most current technology and a passion for people. They should also be willing to listen to their patients, always keeping their health and smile goals foremost in their minds. A dynamic smile says, “I like who I am.” Smiling is good for your health. I encourage anyone who is unhappy with their smile to seek the care of a qualified, experienced and compassionate practitioner. Because when you enhance your smile, you enhance your life! Your general dentist probably doesn’t specialize in restorative dental care, but that doesn’t mean he or she shouldn’t be at all involved. The dental community is interconnected, and it’s very likely your regular dentist will be able to provide you with an excellent referral to someone in your local area. These types of referrals should certainly be taken more seriously than online reviews and similar channels. Quite a few things fall under the umbrella of “cosmetic dentistry,” so you’ll want to start narrowing your search by specific procedure very early in the process. Many dentists will offer the best whitening treatments, for example, since teeth whitening is the most popular cosmetic dental procedure in the country right now, but fewer will offer certain kinds of more complex procedures such as dental implants. You should also investigate the kind of dental technology being offered by any dentist you consider, since it varies widely from office to office; fewer than 10% of dentists, for example, have replaced drills or scalpels with lasers. Browsing galleries of before-and-after photos is a good way to get an idea of what a cosmetic dentist is capable of achieving. However, you should also feel free to ask more specific questions about those photos. What kind of treatment was used to achieve those results, and how long did it take? Are the results depicted intended to be permanent, or are follow-up treatments expected? You should never feel like your questions are being dodged. When you whittle down your list enough to actually go in for a consultation, you should take the entire patient experience into consideration. You should feel comfortable and reassured by the dentist and other staff, and have a general sense that you’re in good hands. Do you have any ideas on how to how to find the best dentist in Sarasota FL? Leave feedback on these tips and share your own thoughts in the comments. An apple a day keeps the doctor away. Unfortunately, there is no such rule for dentists. A healthy smile is not hard to achieve at all, as long as you take proper and consistent care of your teeth. Current dental procedures are remarkable in their effectiveness and their increasingly non-invasive nature, which is good news for dental patients. Now, procedures such as dental implants, bridges, crowns, teeth whitening, bonds, veneers, and tooth reshaping are common and quite accessible. Teeth whitening, in particular, is the most sought after cosmetic dental treatment in the United States. Teeth whitening products alone rake in a formidable $1.4 billion every year. Although at-home teeth whitening products are effective, professional cosmetic dentistry can take it to an ever higher level. Using a combination of laser and chemical gel treatment, a dentist can make your teeth 10 times whiter! Another popular cosmetic dental procedure, dental implants, are great for those with missing teeth. Every year, more than half a million people across the nation go through dental implant procedures. The technology in dentistry makes the procedure very safe and long-lasting. Dental implants, which are usually made from titanium, are embedded into the jaw, which naturally heals around it, making the implant totally secure. Dental implants have a high success rate and, most of the time, can last for life. Restorative dental care isn't magic. It's medically proven that it works time and time again. Of course, cosmetic dentistry is no replacement for oral hygiene but rest assured, dental patients that take care of their teeth will fare much better than those who do not. Whether you are interested in gaining a whiter smile, replacing a missing tooth (or several), or want to install a crown, cosmetic dental work is truly the way to go -- apples or no apples. A vibrant, healthy smile not only is good for your oral health, it's contagious. The more you smile, the more others around you tend to smile as well. In order to get a healthy smile, it's important to keep it... well, healthy! Daily care of your gums and teeth is a must for any set of pearly whites. But even then, sometimes your teeth need professional dental work. Cosmetic dentistry truly works wonders for thousands of men and women who want their teeth to look, and feel, their very best. There are a number of cosmetic procedures a dentist can perform, including whitening, bonding, tooth reshaping, dental implants, crowns, bonds, veneers, and caps. Of those options, teeth whitening is the most popular cosmetic dental procedure in the United States. Teeth whitening is the process of making your enamel whiter by using either laser treatment or bleaches. Under the right conditions, a cosmetic dentist can make your teeth 10 times whiter! Every year, Americans spend more than $1.4 billion on teeth whitening products. Dental implants are also a very popular cosmetic dental option. Unfortunately, many people lose teeth at some point in their lifetimes, either due to bad hygiene, injury, or other factors. Dental implants are simple metal screws (typically made out of titanium) that are embedded into the jaw bone, which will naturally heal, allowing the implant to secure itself. Once the implant is fully embedded, the synthetic tooth can be attached to the end to replace the missing tooth. Dental implants can last for life and have a success rate of 98%! Now that's a healthy smile. There are other options to choose from, and there are many dentists that perform and even specialize in cosmetic dental work. For whatever oral problem ails you, there's a dentist just dying to give you a full mouth of teeth, shining and healthy. Beautiful dental work is just a click away! What do you think about cosmetic dental work? What are your current dental habits? Do you want to improve your smile? Feel free to leave a question or comment at the bottom. Cosmetic dentistry is the art of enhancing – rather than changing – a person’s appearance through various techniques applied to the teeth and gums. For some people, it’s an option to restore health to decayed or flawed teeth. For others, a younger and more attractive smile is a major component in achieving overall self-improvement and greater self-confidence. Tell me the truth – isn’t cosmetic dentistry really only about appearance? You may be surprised to learn that cosmetic dentistry is not only done for cosmetic purposes. A poor bite can affect joints, facial muscles and even posture. I have helped many patients correct their bites, enhance chewing and digestion, and correct speech issues. Cosmetic dentistry isn’t just about vanity – by enhancing your smile, you can truly enhance your life. What are some of the aesthetic elements that must be considered in cosmetic dentistry? Success in the demanding field of aesthetic dentistry depends on enhancing shade, dimension and shape of natural teeth. This requires a practitioner with creativity, talent and basic intuition. Not only do I consider nuances like the translucency of the edges of the teeth and the appearance of the gumline, I can even improve the shape of the lips with the emergence profile of the teeth. Will I still look like me after cosmetic dentistry? It’s not unusual for my patients to report that their friends and colleagues are very complimentary about their new appearance but can’t always put a finger on what is different about them. They are asked, “You look so much more relaxed – have you changed your weight, do you have a new hair style?” Whatever the comments are, the bottom line is that the changes are always youthful and look natural! Having a healthy smile is something nearly all of us want, but maintaining your pearly whites is much harder in practice. First and foremost, you must take care of your teeth everyday for that beautiful, vibrant smile. However, even with proper hygiene, your efforts alone are sometimes not enough. If you are looking for another way to improve your smile, consider cosmetic dental work. Cosmetic dental patients will tell you the wonderful results of cosmetic dentistry. A healthy smile can be achieved through a variety of ways with cosmetic dental surgery. Cosmetic dentists can perform procedures such as teeth whitening, bonding, veneers, tooth reshaping, dental implants, and crown lengthening. Teeth whitening, for example, is the process of whitening the enamel of your teeth using a variety of tools such as bleach and lasers. A cosmetic dentist can whiten your teeth by upwards of tenfold. It is the most popular cosmetic dental work done in the U.S. Americans purportedly spend an astonishing $1.4 billion on teeth whitening procedures and products. Another cosmetic dental procedure, dental implants, is also very popular. Those of us without a full mouth of teeth are in need of replacements, and for that dental implants are highly effective. Dental implants are simply synthetic teeth usually made out of titanium that is screwed into the jawbone, which will naturally embed and heal around the tooth. Dental implants have a success rate of 98%! With results like that, who could resist the lure of cosmetic dental procedures? So, whether you are trying to replace a tooth or just want to make your smile even brighter, your dental options -- much like a healthy smile -- have never looked better! What do you think about cosmetic dental work? Have you or anyone you know gone through it? Feel free to share your experiences and comments at the bottom. Going to the dentist every year is recommended to maintain a healthy smile. However, sometimes a traditional dentist isn't enough. For procedures such as teeth whitening, dental implants, bonding, veneers, crowns, and bridges, cosmetic dentists are much better trained and experienced. Restorative dental care, whether it is something that's niceto have done (such as teeth whitening) or something more restorative (such as teeth implants), is a burgeoning and impressive field of dentistry. Current dental procedures have gone through extensive innovation in the past 30 years. Technology in dentistry has improved, making restorative dental care much more efficient and accessible to the wider public. Indeed, figures show that every year, half a million Americans install dental implants. Moreover, Americans spend an estimated $1.4 billionannually on teeth whitening products and procedures. There is no shortage of people today who want to improve their teeth with the best means available. How reliable is restorative dental care? Well, the results speak for themselves. According to the American Academy of Implant Dentistry, more than three million Americans have dental implants. And according to various scientific studies, the success rate of dental implants stands at an astonishing 98% and can last for a lifetime. Teeth implants are usually made of titanium. They are screwed into the jawline, which will eventually heal over it and securely fasten it in the mouth. Cosmetic dentistry whitening is also very effective. Using bleach and laser technology, cosmetic dentists can whiten teeth by up to 10 shades. With such stellar results, it is no wonder that teeth whitening is the most popular cosmetic dental procedure in the U.S.
Of course, it is most important to take care of your teeth yourself and to first see a regular dentist for your dental needs. However, if you would like that little extra for your pearly whites, restorative dental care may be just the thing for you. What are your thoughts about cosmetic dental procedures? Feel free to leave a comment at the bottom. Happy smiles! Did you know that every time you smile, you throw a little feel-good party in your brain? Smiling activates neuropeptides that work toward fighting off stress. The release of serotonins and endorphins not only relaxes your body but can lower your heart rate and blood pressure. Serotonin release brought on by a smile can act as a mood lifter without a prescription from your doctor! Sadly, there are those people that actually hold back a smile for the simple reason that their lackluster smile or unattractive teeth keep them from enjoying this natural phenomenon. We have entered into an era where the materials in dentistry rival replacements that are as close to natural teeth as ever before. Procedures and new technology allow diagnosis and treatment to be more comfortable and efficient than ever before. Especially when the comprehensive treatment allows one to happily admire their smile in the mirror afterwards. The art of aesthetic dentistry can be defined as combining beauty in form along with ideal function. The smile actually is considered by many to be a reflection of a happy, comfortable and successful life. The truth is the teeth are more than just a part of our masticatory system for digesting food. The mouth is intimately linked to our well-being, our pleasure and sensations with food and communication, both verbally and non-verbally. There are a multitude of sophisticated technologies and materials that allow recreation of dentistry to be more predictable, more comfortable, efficient and natural looking. Procedures that required multiple trips we can now perform in only one or two visits. With the advent of lasers, we find the need for profound anesthesia and post treatment pain is diminished and often eliminated. Gummy smiles can be modified and evened out to be more harmonious with that lip line. Early detection of decay can be found with lasers to treat prior to extensive cavities that are more painful and costly to treat. Low level lasers are used to decrease pain and inflammation in the TMJ while corrections to the bite are accomplished to solve the joint problem. It is a very exciting and wonderful world in dentistry when treatment is well thought out and treated comprehensively. Digital x-rays now reduce patient’s exposure to radiation by over 80%. Digital x-rays allow us to enhance, enlarge or contrast the image to improve our ability to detect disease. They are viewed instantaneously with surpassed quality of traditional methods. A study published in the Journal of Neuropsychologia, reported that seeing an attractive smiling face, activates a region in your brain that processes sensory rewards. This process actually allows you to feel rewarded when a person smiles at you. Often this coaxes the brain to return the favor, thus releasing feel-good chemicals increasing healthier, happier lives. The world is really a better place when you smile! A SMILE IS A GIFT THAT YOU GIVE TO OTHERS. A smile is a gift that you give to others. It connects us to each other in a way that nothing else can. This is a strong theme found in Dr. Koval’s practice, where she has garnered widespread recognition for the thorough, gentle and focused attention she delivers daily. 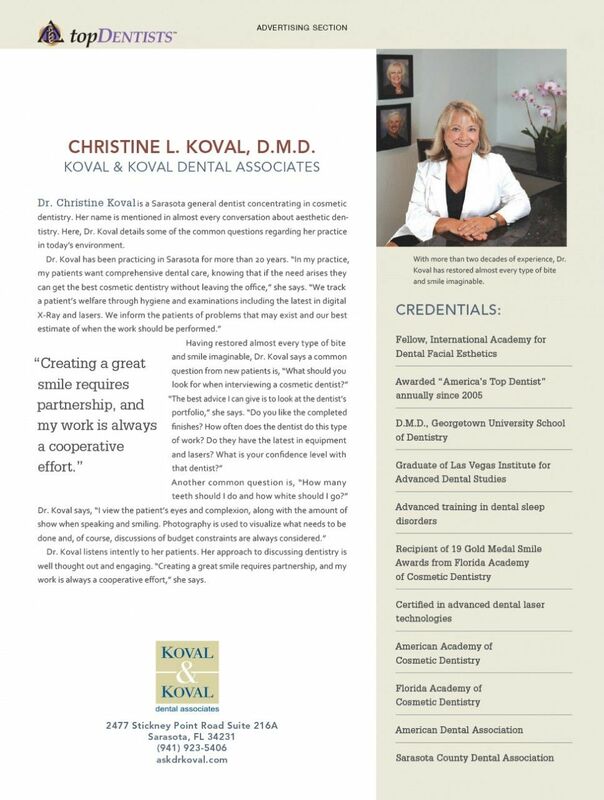 A graduate of Georgetown School of Dentistry, Dr. Koval has been in practice for over 25 years and earned a host of awards and honors throughout that time. The Florida Academy of Cosmetic Dentistry has awarded her over 18 Gold Medals for best cosmetic improvements and natural-looking smiles. She also has received fellowship to the International Academy of Dental Facial Aesthetics, and was voted a Top Dentist by her peers for Best Restorative and Cosmetic Dentist. It is no wonder that Dr. Koval has been honored as one of “America’s Top Dentists” annually since 2005. Her practice specializes in state-of-the-art cosmetic dentistry procedures, including oral prosthetics, full-mouth reconstruction, implant, restorative dentistry, neuromuscular dentistry, teeth whitening, full smile makeovers, as well as general dentistry. “My patients want comprehensive dental care, knowing if the need arises they can get the best cosmetic dentistry as well,” said Dr. Koval. 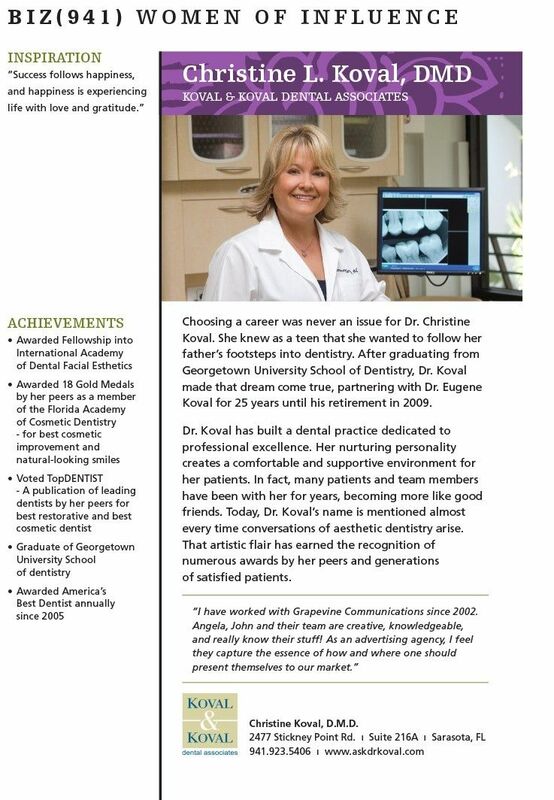 Dr. Christine Koval is a Sarasota general dentist concentrating in cosmetic dentistry. Her name is mentioned in almost every conversation about aesthetic dentistry. Here, Dr. Koval details some of the common questions regarding her practice in today’s environment. Another common question is, “How many teeth should I do and how white should I go?” Dr. Koval says, “I view the patient’s eyes and complexion, along with the amount of show when speaking and smiling. Photography is used to visualize what needs to be done and, of course, discussions of budget constraints are always considered.” Dr. Koval listens intently to her patients. Her approach to discussing dentistry is well thought out and engaging. “Creating a great smile requires partnership, and my work is always a cooperative effort,” she says. Choosing a career was never an issue for Dr. Christine Koval. She knew as a teen that she wanted to follow her father’s footsteps into dentistry. After graduating from Georgetown University School of Dentistry, Dr. Koval made that dream come true, partnering with Dr. Eugene Koval for 25 years until his retirement in 2009. Dr. Koval has built a dental practice dedicated to professional excellence. Her nurturing personality creates a comfortable and supportive environment for her patients. In fact, many patients and team members have been with her for years, becoming more like good friends. Today, Dr. Koval’s name is mentioned almost every time conversations of aesthetic dentistry arise. That artistic flair has earned the recognition of numerous awards by her peers and generations of satisfied patients. 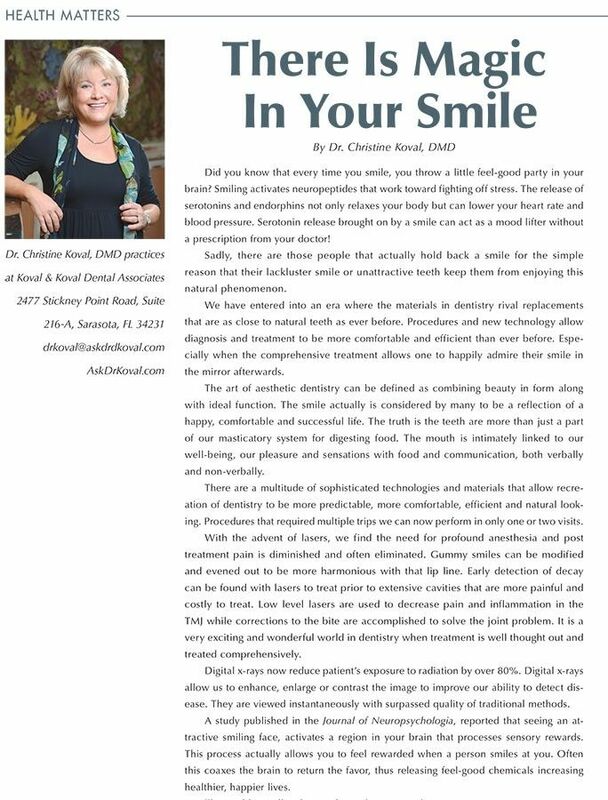 Dr. Christine Koval devotes as much caring attention to giving patients the best dental visit they’ve ever experienced as she puts into the health and beauty of their smiles. 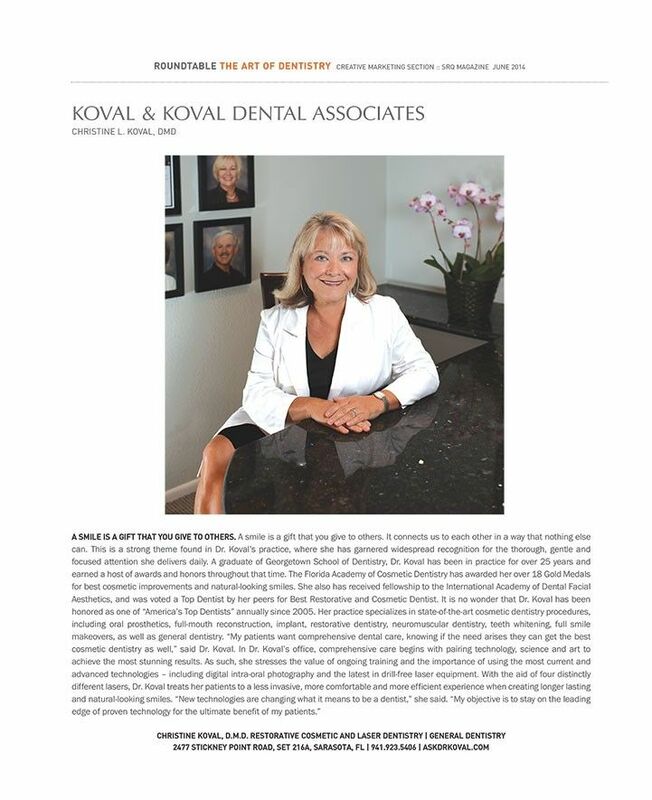 Dr. Koval has earned a multitude of awards from professional dental organizations for her beautiful and very natural looking smile restorations. She is known for her artistic ability combined with precise function. She also is devoted to the people she helps. Whether patients see her for general dentistry to ensure their teeth last a lifetime or for aesthetic improvements, she ensures they understand and approve a comprehensive treatment plan that fits their budgets. That includes showing them needed work with intra-oral cameras and giving cosmetic patients a preview of how their finished smiles will look. Dr. Koval offers patients treatment with cutting edge technology, including five different lasers. Extreme comfort and efficiency are the benefits of Laser Dentistry with the need for anesthesia often being reduced. Dr. Koval has a reputation for a soft and gentle touch. Comfort is paramount, and in addition to options for painless dentistry, she has created a soothing, spa-like environment with warm neck pillows and blankets, soft music and massage chairs for each patient.